Thanks for the simple example. Learning Apex is a very slow process when you are the only one around who is using it. I appreciate that you gave a location on the page to put the getJSON function because it's not obvious to a newby. My page items are named slightly differently (obviously on page 1, not page 10, and empname not ename). 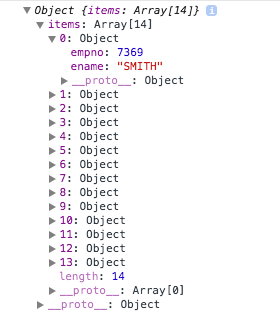 And the alert does display SMITH, so the value appears - on page load - to be obtaining data from the JSON object. But the value is not displayed on the page itself, in the Display Item P1_EMPNAME. It's label is there, but the value is not. Where is Apex resetting the value that is set on page load? Probably because it's a display only item... if it's a text item it should work. My only remaining question was posted on your previous blog: If I duplicate your emp_json web service in my apex.oracle workspace, what URL do I use to call it? If you hit the TEST button in your webservice you see the url you should use. Below is what I tried ... it is always good to know there are multiple ways to do it.